There are a couple of key professionals in the hearing industry that are associated with improving hearing health. One of those professionals is a hearing instrument specialist (HIS), who plays an important role in hearing healthcare. The HIS is essential when it comes to selecting the right hearing aids for your needs, in addition to the fitting of your new devices. The hearing instrument specialist at Texan Renew Hearing Center is committed to helping you find the right technology to improve your quality of life. What is a hearing instrument specialist (HIS)? A HIS is a professional that helps patients with hearing problems. They test for hearing loss and recommend the best hearing aids to improve symptoms. Most hearing instrument specialists focus on finding the best treatment possible for adults with hearing loss. They know the ins and outs of the latest hearing aids and can be trusted to make great device recommendations. Their knowledge isn’t limited to hearing aid devices; it also extends to amplified telephones, assisted living devices, alarm systems and more. Patients can count on their professional to be up-to-date with the latest technology in the hearing industry, including important upgrade information. When should someone seek out a HIS? Any adult that is having issues with their ears should see a hearing specialist. Finding a hearing instrument specialist is important during the early stages of hearing loss. Getting a hearing test will give patients vital health information. Minor complaints about hearing are often ignored until they become much worse. These minor symptoms have the possibility to become long-term if help is delayed. Improved hearing is an option when patients reach out to Texan Renew Hearing Center. What kind of certification has the HIS at Texan Renew Hearing Center received? Denise Kopecki, BC-HIS at Texan Renew Hearing Center, is a licensed Nationally Board Certified Hearing Instrument Specialist. She is a graduate of Sam Houston State University and National Board Certified in Hearing Instrument Sciences from International Hearing Society. To become Nationally Board Certified by the International Hearing Society, you have to practice for at least 2 years, and pass board exams. Board Certified HIS are held to a strict code of conduct and continuing education requirements, to maintain the highest level of service from hearing professionals across the globe. Read about our dedicated hearing care team below. Call today to make an appointment with our staff. 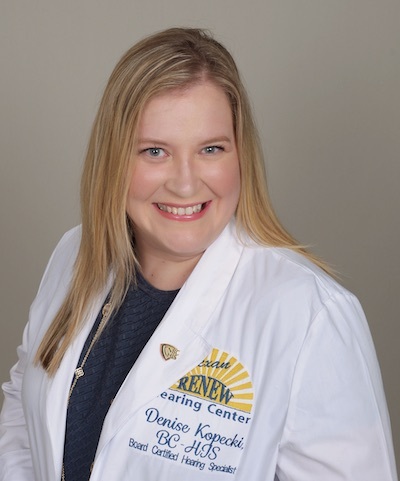 Denise Kopecki, owner and licensed Board Certified Hearing Specialist, is a graduate of Sam Houston State University and National Board Certified in Hearing Instrument Sciences from International Hearing Society. Denise is a lifelong Texan and grew up in the Houston area and relocated to New Braunfels in with her husband, Patrick area in 2009. Stephanie began with Texan Renew in early 2017. Since then she is has become an invaluable member of our hearing health team. She is the first face you see in our San Marcos location. She is always happy to help with pairing technology and smart phone support questions. She also helps coordinate insurance coverage and supply needs our patients may have. 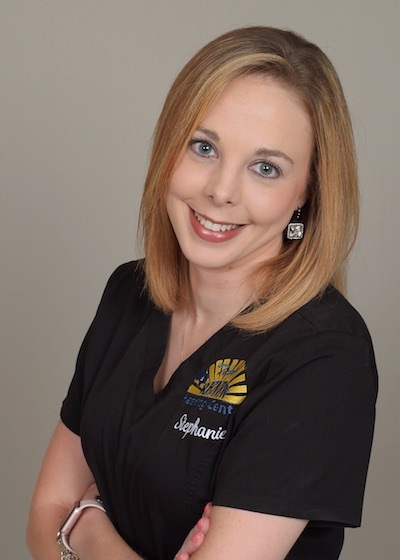 Stephanie moved to New Braunfels, Texas in 2002. Stephanie has a big family were there is never a dull moment and loves spending time with them. She graduated from New Braunfels High School in 2006 where she later met her husband Lee Dawkins. She is the mom to three very active kids and most evening can be found at a ball field cheering them on. In Stephanie’s free time, she loves to hang out with her children and Lee as well as other family members and friends. Stephanie’s three children and husband are her pride and joy. Mandie is a people person through and through, I enjoy interacting with the public, our community, and our family of patients. I strive to have a nurturing heart and to be a genuine person, and I hope to always be this way. My goal every day is to create a positive environment at our office, a place where each and every patient feels welcomed and at home. Mandie is mother to Brice who keeps her busy with raising animals for FFA. She has lived in New Braunfels her whole life and family dates back to when Prices Solms came over from Germany.